The bar says it doesn't allow any hats, but the man is disputing that. 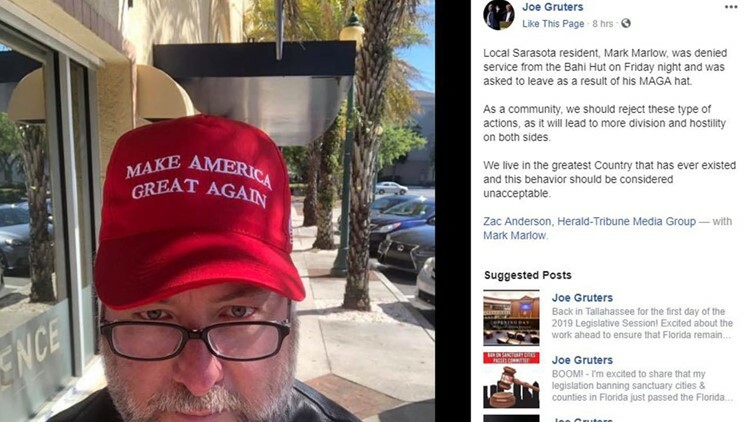 SARASOTA, Fla. — A man says he was kicked out of a Sarasota bar because he was wearing a "Make America Great Again" hat. Mark Marlow, 51, told the Sarasota Herald Tribune he was wearing the hat popular with supporters of President Donald Trump when he went to the Bahi Hut Lounge on Friday. He says an employee of the bar told him he would not be served and said he should leave. Later, the employee told Marlow to leave or he would call the police. The owner of the bar, Jim Beck, told the newspaper there is a "no hat" policy at the bar, and the employee told him that's why he asked Marlow to leave. Marlow disputes that, saying another patron was wearing a Pittsburgh Steelers' hat and was not asked to leave. Marlow contacted the head of the Sarasota Republican Party, Joe Gruters, who took to Facebook to criticize the bar. "As a community, we should reject these type of actions, as it will lead to more division and hostility on both sides," he wrote. Marlow says the owner of the bar called him to apologize. Beck says he is still investigating.